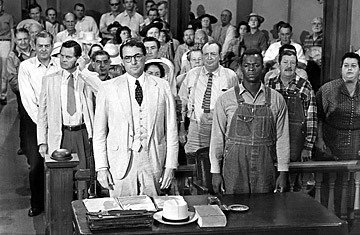 Gregory Peck, Brock Peters in To Kill a Mocking Bird, 1962. Mulligan, who died Saturday at 83 of heart disease, had been Finch's gentle shepherd, and deserved at least a share of Peck's Oscar both for casting him and for eliciting the actor's best work. But the director's heart, here as in so many of his films, was with the Finch children. If Mulligan had an abiding interest, it was troubled youngsters on the cusp of discovering themselves by confronting the world around them. This theme occupied him from his first feature film to his last. The 1957 Fear Strikes Out gave Anthony Perkins his first lead role as Boston Red Sox star Jim Piersall, reduced to bipolar rage by a domineering parent (sort of a Psycho in Center Field). In The Man in the Moon, Mulligan's swan song in 1991, Reese Witherspoon made her film debut as a 14-year-old wracked with first love for a 17-year-old boy who covets her older sister. Born in the Bronx in 1925, Mulligan served in World War II and attended Fordham University before entering the TV industry in its New York infancy. He was a prominent member of that first generation, the so-called Golden Age of Television, that birthed directors who would win Oscars (Sydney Pollack, George Roy Hill, Franklin J. Schaffner, William Friedkin) or be nominated for them (John Frankenheimer, Norman Jewison, Arthur Penn, Arthur Hiller, Robert Altman). Directing scripts by such comers as Gore Vidal, Reginald Rose and Horton Foote, he learned a reverence for the word and for the midcentury liberalism it embodied and ratified. Solid, non-Communist, arguably paternalistic, this was a liberalism more social than political. A better word would be humanism. That was the tone and worldview that Mulligan's best films would radiate. From the start he was skilled in finding young actors and locating their emotional acuity. Mulligan directed Paul Newman in his second TV appearance (Suspense, 1952), and three years later in the Vidal TV play The Death of Billy the Kid, which Newman replayed on the big screen as The Left Handed Gun. Steve McQueen, Sidney Poitier, Walter Matthau, Rosemary Harris and George C. Scott did potent early TV work under his guiding hand. Scott made his Broadway debut in the only play Mulligan directed, the 1958 Comes a Day. He was no slouch with veterans either, winning an Emmy in 1960 for directing Laurence Olivier (in his first TV production) in The Moon and Sixpence. Moving to the big screen, Mulligan found a happy partnership with producer Alan J. Pakula. Together they made seven films, most of them centered on young people with the will to rebel but not always the means. In Love with the Proper Stranger (1964), Natalie Wood is an Italian Catholic shopgirl who becomes pregnant in the one-night-stand immaculate conceptions familiar in movies of the '60s (and today; see Knocked Up). But since she had the good fortune to be impregnated by McQueen, true love is assured. The plot is Hollywood hokum with a patina of New Yawk grit, but Mulligan was always an ace at revealing the subtle starlight behind the Kleig lights.